It’s fair to say we quite like a guideline here at StE’s. We have, probably like your ED, evidence-based clinical decision support guidelines for common (think cardiac chest pain and ?PE) and not so common (think porphyria) conditions with the intention of speeding decision-making, delivering safer care and reducing waste on unnecessary admissions and tests. Guidelines support our junior members of staff to facilitate the difficult referral as it’s tough for the cardiology registrar to turn down a referral that the guideline (agreed with their boss) mandates. So, guidelines are great, although they generate their own difficulties as one of our major problems these days is to keep them up to date, and also to ensure that they actually get used! Last Friday, NICE published the latest in their guidance, this time on acute heart failure. This is a subject dear to my heart for reasons that are no longer clear and I am currently trying to write a Masters dissertation looking at emergency care and developing my own guideline. Iain, in his benevolence, got my weekend off to a flying start by emailing it to us all. I took one look, landed on the recommendation (1.3.3) that encourages the use of intravenous diuretics, and turned off the laptop in disgust. However, my commitment to #FOAMed (and Simon) nagged me to such a degree that I felt obliged to look at the guideline in further detail. This is a difficult guideline to love. 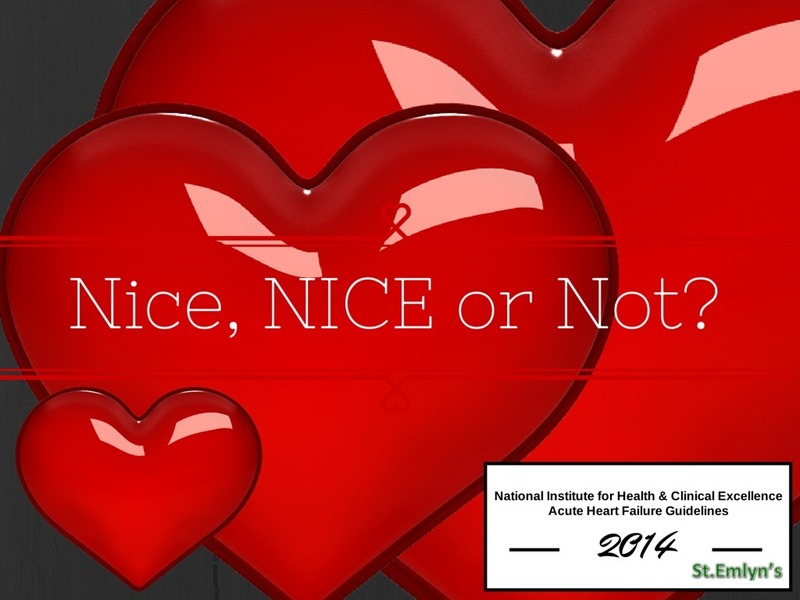 For a start, what do NICE mean by “acute heart failure”? Do they mean the slightly breathless arteriopath with CKD 3 referred to AMU by their GP? Or do they mean the “Oh **** you look like you’re about to die and I need to treat you with maximal therapy right now” patient that wakes ED physicians from their torpor of drunk revellers at 0530? There is a big difference in both pathogenesis and treatment between the two. What I find unclear and worrisome is the assumption that all heart failure is the same. Most of us would agree that there is a significant amount of heterogeneity in acute heart failure syndromes and that diuretics may be useful in those that are hypervolaemic (eg for those in whom renal function has declined or those that have taken medicines that help retain salt and water). However for the other groups, many of whom may be euvolaemic, or even hypovolaemic, diuretics can be harmful. Have a look at table 1 in this (from Critical Care Medicine, but via an obscure route) for a more useful classification. I can’t find a link to this in the NICE guidance and I am concerned that they have not considered it. Having said that, there are certainly parts of it that I do agree with. I look forward to seeing how Cardiologists in hospitals less well staffed than Virchester respond to the suggestion that they should be providing more and earlier echocardiography (which is arguably a role for the emergency physician and an opportunity to drive this forward in our departments) and how the labs adapt to demands for B-type Natriuretic Peptide testing which is currently done twice weekly and not available to us in the ED. This is also an opportunity to work alongside our heart failure specialist nurses to link in with the chronic heart failure pathways that already exist. Many of our patients are acute on chronic exacerbations so we should not miss this opportunity to join up care across the NHS. This has multiple benefits, primarily in patient satisfaction and delivering quality care, but also in reducing future ED attendances that all our patients will benefit from. “1.3.3 Offer intravenous diuretic therapy to people with acute heart failure. Start treatment using either a bolus or infusion strategy. Loop diuretics have been the mainstay of treatment for heart failure for decades. Unfortunately, given this acceptance, there is no RCT trialling diuretics against placebo. The medical classic “The House of God” gave us the Laws of the Fat Man, central of which is number VII “Age + BUN = lasix dose”. Like Tank-tops and Disco, I assumed that these had vanished. Certainly no Emergency Physician that I know uses a diuretic in resus. What worries me most about the NICE recommendation is that there is an acceptance that diuretics are standard therapy and the Guideline Development Group devote their energies to deciding on the optimum strategy, rather than whether diuretics are really necessary. This is taken from Hasselblad et al. reporting on the ESCAPE trial and is available free, here. Whilst at low dose, diuretics seem to be without problem, certainly in the doses commonly recommended, there is increasing mortality. See also Cooper et al., analysing the results of SOLVD who found a risk of arrhythmic death with non-potassium sparing diuretics (RR 1.33, P=0.02). An ADHERE registry analysis (available here) suggested that doses of furosemide under 160 mg had a lower risk of in-hospital mortality, ICU stay, prolonged hospitalization, or adverse renal effects. NICE base most of their recommendation for diuretics on this paper by Felker. This is a bit concerning for many reasons. First, the 2 primary outcome measures are “patient’s global assessment of symptoms, measured with the use of a visual-analogue scale and quantified as the area under the curve (AUC) of serial assessments from baseline to 72 hours” and “the change in the serum creatinine level from baseline to 72 hours”. Both of these smell a bit funny and neither are POO (patient oriented outcomes), although they may be a bit s%£&. You have to get to the final sentence of the second paragraph for the SECONDARY “clinical end points, including the composite of death, rehospitalization, or an emergency room visit within 60 days, as well as the composite of total number of days hospitalized or dead during the 60 days after randomization”. Another thing that concerns me about this is the huge rate of Serious Adverse Events – 44% in each group, P=0.92. Well, clearly we in EM are wrong. I, like many of you, have used these as my mainstay for around a decade. Nitrates have multiple potentially beneficial effects such as arterial and venous dilatation causing reduction in preload and afterload. There are also other Further benefits of nitrates that NICE don’t consider. As usual Cochrane have done their homework. The short version is available here. Due to the poor evidence they were unable to make a recommendation. This is clearly an area, like diuretics, where decent RCTs must be developed. We all know that absence of evidence of benefit does not equate to evidence of absence of benefit. I suspect, much like with thrombolysis in stroke, the jury in the ED differs in it’s opinion from that of the experts. There are multifactorial reasons for this. Personally in the absence of evidence of harm, and a bit of a headache is not a serious adverse event, compared to knackered kidneys (furosemide) or death (opiates), I’ll keep on using it for anyone with an SBP > 100. So that’s not “routinely” then. I’ll also dial the infusion up regularly and be prepared for the crash in BP when the sympathetic drive has been turned off. StE’s ED, like your own provides >= Level 2 care in resus and that can follow through to your coronary care or high dependency units where the sickest patients should be transferred to for continuing monitoring and support. “1.4.1 Do not routinely use non‑invasive ventilation (continuous positive airways pressure [CPAP] or non‑invasive positive pressure ventilation [NIPPV]) in people with acute heart failure and cardiogenic pulmonary oedema. Now this recommendation I really don’t get. If, as I have done, you download the appendices here, and scroll down to page 379, the NICE GDG have put in some Forest plots. All of the ones relating to the ED, including 7 day mortality, mortality for patients receiving care in the ED, intubation rate and intubation in the ED, significantly favour the use of NIV. When you compare these to the Forest plots for diuretics which are routinely recommended, the difference is startling. I’m not too sure to be honest. Although there is an Emergency Physician in the GDG, the recommendations seem far removed from what I have seen in ED practice. I suspect we will continue to disagree, which is healthy, as long as we each come armed with good evidence and are prepared to debate. I still see my job, as an upstairs care downstairs kinda guy, to reverse the acute physiological insult and to get the patient ready for whatever vicissitudes that the acute physicians and cardiologists can throw at them (which includes furosemide if you want to give it in AMU or the cardiology ward – just don’t even think about giving it in my resus). I still think there’s work to be done around timing of beta-blockade and ACE inhibition, spironolactone timing and dosing – all of which have documented benefits in chronic care; access to the cath lab and a huge amount of work needs to be done with the sickest group of patients who present in cardiogenic shock for whom there remains a high mortality and few proven therapeutic options. Lastly, we really need to work on some agreed definitions of the different types and severities of AHF. What I as an EP recognise in the resus room cannot be grouped together with the patient who have a marginal increase in symptoms seen in the primary care setting. Clearly if we lump them all together then we could end up giving the wrong therapy for the wrong patient, and I am concerned that this guideline may result in exactly that. I look forward to intelligent debate over this. Thank you for the commentary. I too am very surprised by this guideline. It brings to mind the recent cholesterol guideline – I do not know a single gp who has adopted it and I suspect the same will be said for EDs for this guideline. I think NICE is fast losing credibility – a great shame really. My biggest problem with the guideline is not the recommendations – which I found confusing – but the lack of clarity over various types of AHF syndromes. This was made much clearer in the CCM article and last week’s BMJ interpretation of the guideline. I think NICE have fallen into the trap of feeling compelled to produce guidelines for increasing numbers of conditions. This guideline felt a bit confused to me. Another danger is the risk of censure for not following NICE guidance. I hope I have presented a balanced argument for the treatment that I give with supporting evidence. What I’d really like is for a diuretic afficionado to explain their reasoning. Looking on the bright side – morphine didn’t get a mention. Still see it given from time to time despite ADHERE. Although the limitations of the ADHERE analysis were retrospective, I think it’s hard to support opiates (outside of palliation) with an adjusted OR for mortality of just below 5. I have to agree with AliG and the commenters that the answer to the original question posed must be – ‘Not’. Most curious ultimate presentation of ‘evidence’ that resulted in a occasional 20th century recommendation. This is clearly not aimed at our early morning, peri-arrest patients. Won’t be changing my management. Can’t resist a non-medical comment on your great research and perspective of the issues. This is something I was discussing with Simon in resus t’other day. His view was it depends on the presentation and preceding history – which as you pointed out is very heterogeneous. In patients with a classical history of worsening heart failure which has now tipped into acute heart failure, where they are chronically fluid overloaded, diuretics have a role – as they have significant venous congestion. I guess in the Critical Care Medicine paper you referenced to – these patients would be category 2 or 5. But in certain other patients – where actual venous congestion is not a significant feature, then diuretics will not help a great deal, and potentially lead to severe adverse outcomes. I think (as a humble, relatively inexperienced FY2 remember), that a lot of people tend to lump all HF patients into one group – much like NICE have. A lot of it comes down to common sense and using clinical judgement as to whether there is actual systemic fluid overload present. The same goes for nitrates. If they are profoundly hypotensive, then they are obviously risky. But if not, they have really good benefits. As you have pointed out – there is a lack of good trials for both therapies, and in the absence of this – clinical judgement should used a lot more. Thanks Ben. I’d agree with all that and the theme that we need to tailor our approach to the management of HF patients to the cause. That requires a careful assessment and thoughtful therapeutic approach. If I develop acute heart failure, don’t be NICE to me, OK? Developing Emergency Medicine in Fiji, this comes up all the time. In the ED, patients now get nitrates and CPAP. Physicians still want to hit them with frusemide. We present the evidence of harm….. they are wedded to their practice. I thought this was because many practices in Fiji require updating. I read with interest that this guideline does not include statements of harm regarding early high dose frusemide. Reminds me of being a young Dr in the UK in the late 1990s.